I’ve been thinking about writing a post about Anxiety on and off for a long time. It is definitely different from my usual posts but I think it’s time to speak up and step out of my comfort zone. 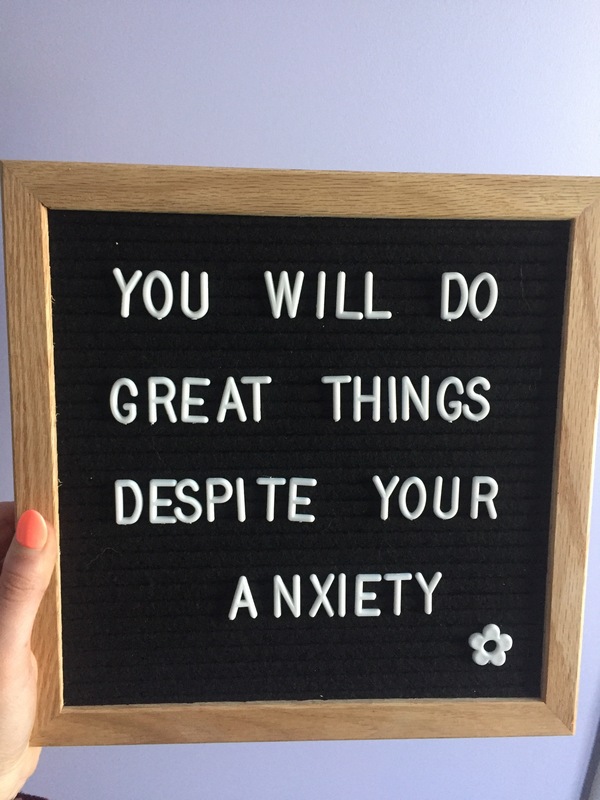 I have anxiety, and to this day, it is one of the hardest things I have ever dealt with and I still have such a difficult time talking about it. It’s a big part of my life and I feel it each and every day. Some days more so than others. I started having symptoms of anxiety right before my birthday a couple of years ago. Now keep in mind, not everyone gets the same symptoms. It started with constant feelings of nervousness and always having to go to the bathroom. I could barely eat anything as I was always nauseous. I started feeling out of breath and it was almost like my body was either tingling or numb. Everything made me super irritated and I wanted to bite everyone’s head off. It was not good. I continuously got worse as the weeks went by and I didn’t know what was wrong with me. I started having attacks. I would start hyperventilating and I thought I was going to die. I knew something was wrong but I was at a loss. I knew I needed help but for the life of me I couldn’t ask for it. I was terrified and I was isolating myself. I didn’t want to leave the house, maybe if I stayed home and didn’t have to deal with anything then it would go away. It obviously didn’t, and I started doing some research. I realized that it seemed like I had anxiety. No one I know has ever really talked about mental illnesses and there is such a stigma around them even to this day. It’s so hard to talk about it because you don’t know how to explain what is wrong and you don’t want to sound crazy. I did anything I could find to get better without having to go to a doctor and without having to tell people that something was seriously wrong. I started a bullet journal, exercise, stopped drinking coffee, and alcohol. I was already losing control and I didn’t need any outside influences to make it worse. After a while I knew I couldn’t handle it on my own anymore. I reached my breaking point and had to go to a doctor. He was the one to diagnose me officially with anxiety. He ran other tests just to make sure. They ruled out the other possibilities. He listened to everything I was going through and suggested I either take a break from school, work, or even both. I already felt ashamed that I couldn’t handle the anxiety on my own so I was definitely feeling overwhelmed. When he warned me that depression and anxiety often occur together I knew I couldn’t take the time off. I knew it would push me further down the rabbit hole and I couldn’t handle the possibility of it. He prescribed medication to take if an attack became too strong. He also suggested seeing someone in order to talk about my anxiety and they could teach me ways to cope with it. I have so much more to say but I don’t want to write a book over here so I’m going to break these posts up. It took me almost a whole year to see a doctor in order to get help. I suffered so much in that year, feeling things I wouldn’t wish upon anyone. With the Bell let’s talk day coming up, I wanted to post this so you know you are not alone with a mental illness. Everyone handles things differently but sometimes you do need to talk about it. It won’t solve it, believe me, I know. But maybe it will help you. If you have any questions, please feel free to comment on this post. If you don’t feel comfortable commenting then you can always send me a message through the contact me page. Please, don’t suffer in silence anymore.